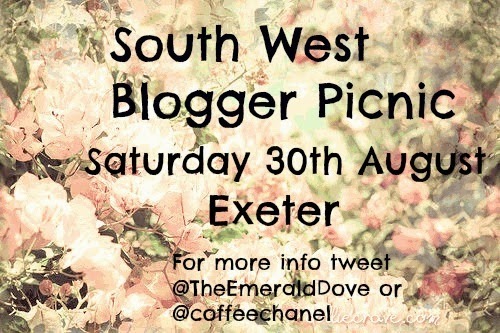 The Emerald Dove: South West Blogger Picnic - You're Invited! South West Blogger Picnic - You're Invited! I have recently been planning with my lovely blogging friend Miriam, from The English Mademoiselle Diaires, a meet-up of some sort here in the South West. We were already pretty set on where to host it and we ending up deciding on a picnic. I then tweeted some West Country bloggers and got a few maybes so we have gone from there and just plucked a date out of mid air (we are praying fervently for sunshine). The picnic is taking place on 30th August (unless that is a terrible date for everyone) and it will be in Exeter with the intention of heading towards the Cathedral Green. So, if you would like to join us, please leave a comment with your email address or Twitter handle so we can forward further info or just tweet/email either of us just so we know how much food to bring and who to expect as we don't want to forget anyone and leave them stranded alone in Exeter.